L. catesbeianus are a large frog reaching up to 20cm in snout-to-vent length (SVL) and up to 800g in weight. They have a robust body with a wide flat head and smooth skin with no wrinkles, warts or spikes (Flores, 2005). Dorsal colour is pale green to dark olive and can have brown spots. Ventral side is white, grey or yellowish (LeClere, n.d.). As sexual maturity approaches in males the upper abdomen temporarily turns yellowish in colour (Flores, 20005). 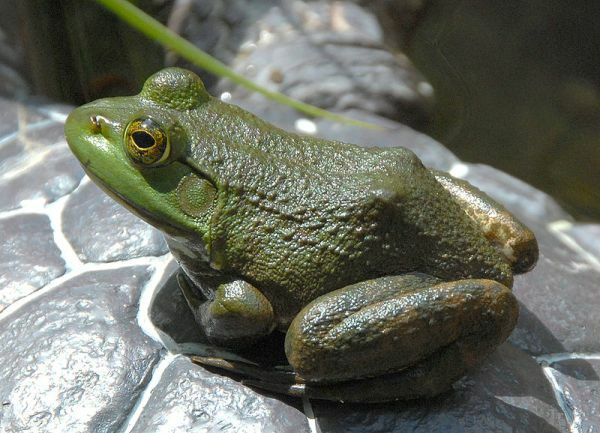 American bullfrogs have conspicuous tympanic membranes (eardrums). Mature males have tympanums twice the diameter of the eye, while mature females have tympanums about the same diameter as the eye (National Research Council, 1974). Males are also slightly smaller than females and have darkly pigmented thumb pads in contrast to the more delicate streamlined thumb of the female (National Research Council, 1974). Bullfrogs, in contrast to the similar green frog, do not have dorsolateral ridges (National Research Council, 1974; LeClere, n.d.). Tadpoles are greenish yellow with small spots, growing up to 15 cm. At least 322 species of reptiles and amphibians have been naturalised across the globe; of these 14 species have had ecological impacts demonstrated or reasonably inferred (Kraus, 2009) and of these only three (brown tree snake (Boiga irregularis), cane toad (Rhinella marina) and L. catesbeianus) are even moderately well studied (Kraus, 2009). The bullfrog is mainly nocturnal, but a loud deep pitched bellow, can be heard during the day (CABI Bioscience, 2005). The mating call has one note that lasts 0.8 seconds at a frequency of 1.0 kHz (Encyclopedia of Life, 2009). To hear the mating call of the American bullfrog please go to Sounds of North American Frogs: The Mating Call of the Bullfrog or AmphibiaWeb. Currie and Bellis (1969 in Casper & Hendricks, 2005) found bullfrogs to have a mean activity radius of 2.6 meters in an Ontario pond. Their data suggest that home range size is reduced at higher densities and increases as the size of an individual increases, and that males have a larger home range than females. Finally, the ongoing climatic changes at global scale can modify the suitability of some areas; for example, global warming can cause an expansion of suitable areas towards higher latitude (Roura-Pascual et al., 2004; Thuiller et al., 2007 in Ficetola et al., 2007b). Longevity for wild bullfrogs is estimated to be eight to 10 years, although a captive specimen survived for nearly 16 years (Oliver 1955a, Goin & Goin 1962, in Casper & Hendricks 2005). Eggs: Eggs are laid in thin sheets on the water surface, covering 0.5 to 1 m², and hatching in three to five days (Bury & Whelan 1984, in Casper & Hendricks 2005). The egg batch forms a floating raft attached to vegetation (CABI Bioscience 2005). Bullfrogs are extremely prolific, producing up to 20 000 eggs per clutch (Schwalbe & Rosen 1999, in Casper & Hendricks 2005). The number of zygotes sired by successfully mating males ranged from 5000 to 59 000 (mean 11 000), with the number of resultant hatchlings ranging from 300 to 29 000 (mean 5600; Howard 1978b, in Casper & Hendricks 2005). Females may lose up to 27% of their body mass during oviposition (Judge et al. 2000, in Casper & Hendricks 2005). Bullfrogs have been intentionally introduced to new habitats as a food resource for humans (Moyle, 1973; Jennings & Hayes, 1985) or for biological control of insects (Jennings & Hayes, 1985; Lawler et al., 1999). They have also been introduced to some areas for farming. However frogs are difficult to farm and farming operations are often unsuccessful (Helfrich et al., 2009; Laufer et al., 2008). Bullfrogs are described as occupying a wide range of aquatic habitats including lakes, ponds, swamps, bogs and backwaters (Conant, 1975; Stebbins, 1985 in Adams et al., 2003), as well as reservoirs, marshes, brackish ponds (in Hawaii), streams (Santos-Barrera et al. 2009), irrigation ponds and ditches (Govindarajulu, 2004). Adult bullfrogs prefer warmer, lentic habitats such as vegetated shoals, sluggish backwaters and oxbows, farm ponds, reservoirs, marshes, and still waters with dead woody debris and dense and often emergent vegetation (George, 1940; Holbrook, 1842; Bury & Whelan, 1984 in Casper & Hendricks, 2005). In a seasonal marsh in Sonoma County, California, bullfrogs selected spikerush habitat in winter and spring, and aquatic buttercup in summer (Cook & Jennings 2007). Bullfrogs bred in spring and summer in deep areas with dense cover, predominantly smartweed (Cook & Jennings, 2007). Areas having high precipitations during both summer and winter, high maximum temperature, high human pressure, and intermediate minimum annual temperature were those with the highest predicted suitability for bullfrogs (Ficetola et al. 2007b). Several authors suggest that bullfrogs may have a preference for highly artificial and highly modified habitats, such as millponds, livestock grazing ponds and reservoirs (Wright & Wright, 1949; Bury & Luckenbach, 1976; Jennings, 1988, Zampella & Bunnell, 2000 in Adams et al., 2003; Doubledee et al., 2003; Ficetola et al., 2007b). 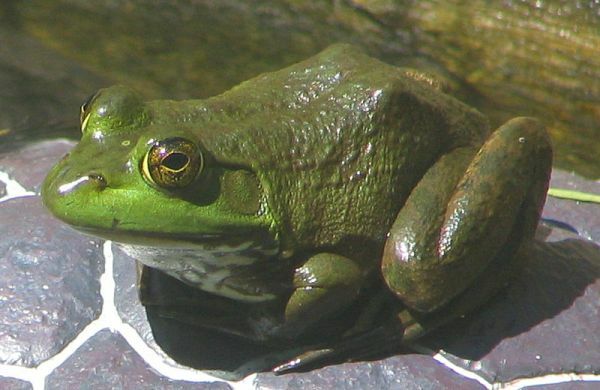 Hayes and Jennings (1986, in Cook & Jennings 2007) pointed out that human-driven habitat modification, such as changes in hydrology from seasonal to permanent water, removal of emergent vegetative cover, and elevation of water temperatures from increased sunlight all favor the establishment of bullfrogs. Yiming et al. (2005) concluded from their study that the ease with which bullfrogs have invaded islands of the Zhoushan archipelago relative to the mainland has little to do with biotic resistance but results from variation in factors under human control. Habitats that are highly modified by human activity are typically characterised by a decrease or complete lack of habitat complexity (Doubledee et al., 2003). In such environments bullfrogs are expected to have high attack rates (the attack rate is a measure of bullfrog search efficiency, specifically the length of shoreline that is kept clear of prey items by a bullfrog in a give time interval). Bullfrogs are expected to be less efficient at keeping a complex shoreline choked with cat-tails and bulrushes clear of prey items than they would be along a shoreline devoid of such vegetation (Doubledee et al., 2003). In other words human-modified habitats probably enhance habitats for bullfrogs by providing optimum conditions for bullfrogs to find and devour their prey. Bullfrogs are sometimes found in temporary water bodies hundreds of meters from permanent water (Santos-Barrera et al. 2009). However, they are typically found in permanent ponds, whereas most other amphibians inhabit temporary ponds. Pond hydroperiod is known to regulate some amphibian communities (e.g., Semlitsch et al. 1996, in Boone 2004) and may mediate the impact bullfrogs have on amphibians. Bullfrogs are often excluded from temporary ponds because they have larval periods exceeding one year, although they can reach metamorphosis in a single season (MDB Pers. Obs. ; Pechmann et al., 2001 in Boone 2004). Bullfrogs will hibernate at the bottom of water bodies or in secluded places on land (CABI Bioscience, 2005). Sexual maturity in bullfrogs usually occurs at one to two years in males, and at two to three years in females (Howard 1981, in Casper & Hendricks 2005). Bullfrogs breed in the vegetation-choked shallows (Pope 1964a, in Casper & Hendricks 2005) of permanent bodies of water. Bullfrog breeding is restricted to warmer periods during spring and summer (Cook & Jennings 2007). In southwest France, the breeding period begins in May and lasts until early September and tadpole development takes one to two years (Lorvelec & Détaint 2006). Bullfrogs are highly territorial and have a polygynous mating system, with the largest males in a population controlling the highest quality oviposition (egg-laying) sites (Howard 1978a b, in Casper & Hendricks 2005). Males defend roughly circular territories two to five meters in diameter (Harding 1997, in Casper & Hendricks 2005). Male bullfrogs will aggressively defend sites by pushing, shoving and biting (Ryan 1980, in Casper & Hendricks 2005). Most physical encounters are won by larger males by engaging in wrestling, shoving, and pouncing (A.P. Blair 1963, Durham & Bennet, 1963, in Casper & Hendricks 2005). Females select a mate by entering his territory (Ryan 1980, in Casper & Hendricks 2005). Female mate choice becomes more discriminating with age, with older females consistently selecting the oldest, largest males as mates (Howard 1978a, in Casper & Hendricks 2005). Older females sometimes vocalize within male choruses, which may elicit higher levels of male to male competition and assist females in selecting high-quality males (Judge et al. 2000, in Casper & Hendricks 2005). Embryo mortality depends on female choice of the oviposition site, the best of which are controlled by the largest males and where water temperatures do not exceed 32°C, over which developmental abnormalities occur (Howard 1978b, in Casper & Hendricks 2005). Bullfrog embryos have the highest critical thermal maximum of any North American frog at 32°C and the lower temperature limit for normal embryonic development is 15°C (Moore 1942, in Cook & Jennings 2007). Bullfrog tadpoles are mainly herbivorous and consume algae, aquatic plant material and some invertebrates (Treanor & Nichola, 1972; Bury & Whelan, 1984 in Casper & Hendricks, 2005). Their efficient gill filters allow them to feed on an impressive diversity of algal species (Kenny, 1969, Wassersug, 1972 in Pryor, 2003) and their labial teeth (which bear a striking resemblance to the radulae of herbivorous snails; Stenick & Watling, 1982 Pers. Obs. in Pryor, 2003) allow them to graze periphyton (Wassersug, 1984; Kupferberg et al., 1994; Kupferberg, 1997a; Altig & McDiarmid, 1999 in Pryor, 2003). Bullfrog tadpoles will also prey on the tadpoles of other species (Kiesecker & Blaustein, 1997 in Blaustein & Kiesecker, 2002). Adult bullfrogs are gape-limited opportunistic predators that employ a sit-and-wait approach to feeding (Bury & Whelan, 1984, Schwalbe & Rosen, 1988 in Casper & Hendricks, 2005). Bullfrogs essentially eat whatever they can fit into their mouths (Roach, 2004), including crayfish, dragonfly nymphs, aquatic hemipterans and water beetles and small vertebrates such as fish, frogs, turtles, snakes, birds, bats, and weasels (Hirai, 2004 and references therein). They have also been known to eat other bullfrogs. In fact, in southern Arizona the most common vertebrate found in bullfrog intestines were other bullfrogs (C. Schwalbe, pers. comm. in Roach, 2004). Introduced crayfish red swamp crayfish (Procambarus clarkii) make up the majority of the bullfrogs' diets in many regions (eg. Colusa National Wildlife Refuge, California (USA); Wylie et al. 2003). Stomachs analysis of adult bullfrogs (N=100) collected on the lower Colorado River, Arizona-California by Clarkson and deVos (1986) revealed crayfish (P. clarki) accounted for the highest volume of food material. Wolf spiders (Lycosidae) were the next most voluminous taxon. Other relatively frequently occurring items included long-horned earwigs, sowbugs, German cockroaches, crickets and plant material. Found less frequently were diverse items such as a young muskrat, rattlesnake, kingsnake, and soft-shelled turtle (carapace length 45 millimeters), several species of fish, an Asiatic clam, a scorpion, and numerous insect species, primarily coleopterans. Hirai (2004) analysed stomach contents of bullfrogs in the Mizorogaike Pond (Kyoto, Japan) and found that adult bullfrogs feed predominantly on crayfish (P. clarkii), and juveniles feed on a diverse range of arthropods. Adult bullfrogs (N=42) were found to contain diverse arthropods and slugs, along with plant materials and minerals. Arthropoda contained five classes (Insecta, Arachnida, Crustacea, Chilopoda, and Diplopoda). Insecta contained seven orders. The most important and one of the largest food items was the crayfish (43.0 to 89.3 millimeters). Beetles, spiders and hemipterans were also commonly consumed. Aquatic prey were as follows: three water-striders, one dragonfly nymph, 62 crayfish and one freshwater shrimp. Food of the juvenile bullfrog (N=79) included a wide variety of anthropods, slugs, pond snails, leeches, earthworms and fish. Arthropoda contained five classes. Insecta contained nine orders. The two most frequently consumed food items were ants and spiders. Ants and spiders were numerically important, but not volumetrically because of their small body size. Dipterans, caterpillars, beetles, and woodlice were also common food items. Volumetrically, crayfish were again the most important food item. The second largest proportion was occupied by beetles As aquatic prey, one water beetle, 13 maggots, four waterstriders, six nymphal dragonflies, two crayfish, 11 freshwater shrimps, seven amphipods, 18 pond snails, one leech and one bluegill were found. In British Columbia, Canada they are sold in aquatic garden supply stores for the enhancement of ornamental ponds.In some cases, bullfrogs have been deliberately introduced to control agricultural insect pests. This pathway has been of limited importance in the second half of the 20th century.They have been deliberately introduced as an aesthetically pleasing wildlife.Species such as R. catesbeiana have been introduced into new locations with the intention of establishing new food sources for human consumption (Kraus, 2009). Although this pathway has been of limited importance in the second half of the 20th centBullfrogs will disperse from artificial water bodies into natural water bodies using seasonal water corridors (Govindarajulu, 2004). Dispersals of at least 3.2 km from the home pond have been recorded, with dispersal distances of seven to eight kilometers likely (Schwalbe & Rosen, 1999 in Casper & Hendricks, 2005). Maximum movement distances of up to 1600 meters (mean 402 meters), as well as homing, were reported by Ingram and Raney (1943 in Casper & Hendricks, 2005) in New York. Review: Stan A. Orchard, R.P.Bio. \ BullfrogControl.com Inc. Recommended citation: Global Invasive Species Database (2019) Species profile: Lithobates catesbeianus. Downloaded from http://www.iucngisd.org/gisd/species.php?sc=80 on 19-04-2019. Disease Transmission: Chytridiomycosis, caused by the fungus Batrachochytrium dendrobatidis, is an emerging disease of amphibians responsible for population declines and even extinctions globally (Hanselmann et al., 2004). Introduced populations of Lithobates catesbeianus can harbour reservoirs of the fungal agent without showing significant clinical disease symptoms themselves (Hanselmann et al., 2004). Native North American amphibians which may be affected by bullfrogs include: the Pacific chorus frog (Pseudacris regilla); the Northern red-legged frog (Rana aurora); the plains leopard frog (Lithobates blairi); the northern leopard frog (Lithobates pipiens); the lowland leopard frog (Lithobates yavapaiensis); and the entire suite of central Californian amphibians (Kraus, 2009). Similar declines in native species concurrent with the introduction of bullfrogs have been noted in Europe, in Germany (C.R. Boettger, 1941; Thiesmeier et al., 1994 in Kraus 2009), Florence (Italy) (native Rana; Touratier. 1992b in Kraus 2009) and in the Aquitaine of southwestern France (native fish; Touratier, 1992a in Kraus, 2009). Ecosystem change: Several field studies portray tadpoles as ‘‘ecosystem engineers’’ that alter the biomass, structure and composition of algal communities (Dickman, 1968; Seale, 1980; Osborne & McLachlan, 1985; Kupferberg, 1997a; Flecker et al., 1999; Peterson & Boulton, 1999 in Pryor, 2003). Modification of Nutrient Regime: High food intake (Wassersug, 1984 in Pryor, 2003) and high population densities (up to thousands of individuals per m²; Alford, 1986, in Pryor, 2003) suggest that tadpoles have considerable impact on nutrient cycling and primary production in freshwater ecosystems. Predation: Tadpoles of L. catesbeianus feed upon eggs and larvae of the endangered Razorback Sucker (Xyrauchen texanus) in laboratory conditions (Mueller et al., 2006 in Kraus, 2009), and their densities in artificial habitats can depress fish larvae recruitment (Kraus, 2009). Competition: Introduced bullfrogs compete with endemic species (Kupferberg, 1997; Kiesecker & Blaustein, 1997 in Hanselmann et al., 2004). Unlike many other frogs, bullfrogs can coexist with predatory fish (Hecnar, 1997 in Casper & Hendricks, 2005), giving bullfrogs a competitive advantage. Interaction With Other Invasive Species: In Oregon, the invasion of bullfrogs appears to have been facilitated by the presence of the non-native sunfish (Adams et al., 2003). For a detailed account of the environmental impacts of L. catesbeianus please read: Lithobates catesbeianus Impacts Information. For a detailed account of the management and control options to prevent the spread of L. catesbeianus please read: Lithobates catesbeianus (American Bullfrog) Management Information. The information in this document is summarised below. Careful monitoring is necessary for the early detection and management of newly established frog populations (Ficetola et al. 2007a). The successful eradication of Lithobates catesbeianus from Great Britain (Fisher & Garner, 2007) is an exception to the general pattern of eradication failure because the programmes were placed in the hands of conservation-management professionals (Kraus, 2009). Preventative Measures: The presence of the emerging Batrachochytrium dendrobatidis chytrid fungal pathogen (which is responsible for declines in amphibians world-wide) suggests that trade and introduction of amphibians should be monitored (Hanselmann et al., 2004). Hanselmann and colleagues suggest that traded amphibians be made subject to veterinary surveillance and quarantine guidelines developed by the International Union for the Conservation of Nature (IUCN) and the Office Internationale des Epizooties (OIE) (Cunningham et al. 2001, in Hanselmann et al. 2004). In relation to control of the chytridiomycosis disease in amphibians, please see Control Strategies for Diseases in Wild Amphibians. European legislation prohibits new introductions of L. catesbeianus and environmental agencies promote eradication plans (Ficetola et al. 2007a), however, a coordinated effort in the European Union to address invasive species of any kind has not been made (Kraus 2009). Actions are currently are restricted to isolated activities by member states (Kraus, 2009). Genovesi & Scalera (2007 in Kraus, 2009) have proposed a coordinated system of lists covering approved, prohibited, or requiring further study for importation. Doing so would make prevention programs for alien herpetofauna in the European Union more proactive (de Groot & Gerrits, 2002 in Kraus, 2009). L. catesbeianus is listed as an A1 species by the Belgium Invasive Species Forum (BISF) meaning it represents a high environmental hazard and is present in isolated populations (Etienne et al., 2007). Please see BISF definitions for more information. According to the Invasive Species Environmental Impact Assessment (ISEIA) this species earns a score of 12 (out of 12) which puts it in the black list (A category) (Etienne et al. 2007). Physical Control: Adult L. catesbeianus may be killed by shooting, spears/gigs, bow and arrow, clubs, nets, traps, angling or by hand. They can be located using torchlight which also temporarily stuns them (P. Veenvliet Pers. Comm. 2003). L. catesbeianus can be controlled using a reptile-proof fence to catch the neonates and traps in the ground to catch them as they leave the pond. Collecting egg masses can be effective in combination with killing frogs and tadpoles. Knowledge and Research: Studies of actual and potential ecological impacts should be conducted (Santos-Barrera et al. 2009). Education and Awareness: Ficetola and colleagues (2007a) suggest the promotion of educational programs to reduce the risk of new introductions in Europe. Informations on Lithobates catesbeianus has been recorded for the following locations. Click on the name for additional informations. Adams, M.J., Pearl, C.A. and Bury, R.B. 2003. Indirect facilitation of an anuran invasion by non-native fishes. Ecology Letters. 6 (4): 343-351. Summary: Report on a field experiment designed to test the predictions that: (1) non-native fish (bluegill, Lepomis macrochirus Rafinesque) lower the abundance of native dragonfly nymphs, (2) native dragonfly nymphs reduce the survival of bullfrog tadpoles and (3) survival of larval bullfrogs improves when a nonnative fish is present. Berroneau, Matthieu; Detaint, Mathieu ; Coic, Christophe. 2007. First Results of the Telemetry Study of Bullfrogs in Gironde (September 2004-June 2005), Bulletin de la Societe Herpetologique de France 121: 21-33. Summary: American bullfrogs (N=25) were followed by Berroneau, Detaint and Coic (2007) using telemetry near Fronsac, Gironde to determine over-wintering habitats, home range and dispersion trends. Results should help in formulating eradication strategies for Bullfrogs, by helping to define the periods and the places of intervention. Daszak, P; Strieby, A. ; Cunningham, A. A. ; Longcore, J. E. ; Brown, C. C. ; Porter, D. 2004. Experimental Evidence That the Bullfrog (Rana catesbeiana) is a Potential Carrier of Chytridiomycosis, an Emerging Fungal Disease of Amphibians, Herpetological Journal 14(4): 201-207. Summary: These results from Daszak and colleagues (2004) provide the first experimental evidence that American bullfrogs can be infected by Batrachochytrium dendrobatidis, but are relatively resistant to the disease chytridiomycosis, which is lethal to many other amphibian species. Diego A. Barrasso, Rodrigo Cajade, Santiago J. Nenda, Gabriel Baloriani, Ra�l Herrera. 2009. Introduction of the American Bullfrog Lithobates catesbeianus (Anura: Ranidae) in Natural and Modified Environments: An Increasing Conservation Problem in Argentina, South American Journal of Herpetology 4(1): 69-75. Summary: Diego and colleagues (2009) reported on the American bullfrog for the first time in the province of Buenos Aires, Argentina in the locality of 9 de Julio. Doubledee, R.A.; Muller, E.B. and Nisbet, R.M. 2003. Bullfrogs, disturbance regimes, and the persistence of California red-legged frogs. Journal of Wildlife Management. 67 (2): 424-438. Summary: This article discusses the impacts of bullfrogs on the California red-legged frog (Rana aurora draytonii), and examines various management strategies that have been employed. Etienne, Branquart, Laudelout Arnaud, Louette Gerald, Martin Youri & Percsy Christiane. 2007. Rana catesbeiana - American bullfrog. Invasive Species in Belgium. Ficetola, Gentile Francesco; Bonin, Aurelie ; Miaud, Claude. 2008. Population Genetics Reveals Origin and Number of Founders in a Biological Invasion, Molecular Ecology 17(3): 773-782. Summary: The authors used extensive genetic data to assess the history of invasion and to infer the propagule pressure for the American bullfrog. The results show that invasive populations of bullfrog in Europe descend from a handful of founders. The number of founders of invasive populations can be very small and can challenge the monitoring and biological control commonly set up for invaders. Ficetola, Gentile Francesco; Thuiller, Wilfried; Miaud, Claude. 2007b. Prediction and Validation of the Potential Global Distribution of a Problematic Alien Invasive Species - the American Bullfrog, Diversity & Distributions 13(4): 476-485. Summary: Ficetola and colleagues (2007b) looked at habitat suitability models constructed from global data as well as invasiveness models for the European region. They created a worldwide and European projection for the environmental suitability of the American bullfrog. Galli, Leonardo; Pereira, Alfredo; Marquez, Alejandro; Mazzoni, Rolando. 2006. Ranavirus detection by PCR in cultured tadpoles (Rana catesbeiana Shaw, 1802) from South America, Aquaculture 257(1-4): 78-82. Garner, Trenton W. J.; Susan Walker; Jaime Bosch; Alex D. Hyatt; Andrew A. Cunningham; Matthew C. Fishert. 2005. Chytrid Fungus in Europe, Emerging Infectious Diseases 11(10): 1639-1641. Govindarajulu, P. 2004. Introduced bullfrogs (Rana catesbeiana) in British Columbia: impacts on native Pacific treefrogs (Hyla regilla) and red-legged frogs (Rana aurora). Ph.D. thesis. University of Victoria, Victoria. Chapter 7. Summary: Contains detailed information about bullfrogs in British Columbia, Canada, and their impact on native frogs. Govindarajulu, Purnima; Altwegg, Res; Anholt, Bradley R. 2005. Matrix model investigation of invasive species control: Bullfrogs on Vancouver Island, Ecological Applications 15(6): 2161-2170. Summary: The authors studied demography of four populations on southern Vancouver Island, Canada, using field observations and capture-mark-recapture methods to estimate survival, growth, and fecundity of American bullfrogs. Grayson, Kristine L; Roe, Andrew W. 2007. Glow Sticks as Effective Bait for Capturing Aquatic Amphibians in Funnel Traps, Herpetological Review 38(2): 168-170. Group of experts on Invasive Alien Species. 2005. CONVENTION ON THE CONSERVATION OF EUROPEAN WILDLIFE AND NATURAL HABITATS, Group of experts on Invasive Alien Species, 6th meeting, Palma de Majorca (Spain), 9-11 June 2005, BELGIUM / BELGIQUE: Actions taken in Belgium in response to the threats of Invasive alien species. Hanselmann, R.; Rodriguez, A.; Lampo, M.; Rajardo-Ramos, L.; Aguirre, A.A.; Kilpatrick, A.M.; Rodriguez, J.P. and Daszak, P. 2004. Presence of an emerging pathogen of amphibians in introduced bullfrogs Rana catesbeiana in Venezuela. Biological Conservation. 120 (1): 155-119. Summary: In this study, the authors examined histological samples from apparently healthy American bullfrogs that have been introduced into the Venezuelan Andes. Batrachochytrium dendrobatidis, the pathogenic fungus responsible for global declines in amphibians, was present in 96% (46/48) of the individuals examined. In contrast to cases of chytridiomycosis outbreaks, the majority (44/46) of frogs had few, small lesions consistent with little or no clinical disease and no unusual mortality was observed. These findings have implications for amphibian declines in Venezuela and elsewhere. Scalera R., 2007. An overview of the natural history of non indigenous amphibians and reptiles. In: Gherardi F. (editor) Biological Invaders in Inland Waters: Profiles, Distribution and Threats. Springer. Pp. 141-160. Scalera R., 2007. Virtues and shortcomings of EU legal provisions for managing NIS: Rana catesbeiana and Trachemys scripta elegans as case studies. In: Gherardi F. (editor) Biological Invaders in Inland Waters: Profiles, Distribution and Threats. Springer. Pp. 669-678. The Outlaws of the Ecosystem - Invasive Alien Species Ministry of Environment, Republic of Korea. Summary: Report from Republic of Korea. Adams, M. J. 1999. Correlated factors in amphibian decline: exotic species and habitat change in western Washington. J. Wildl. Manag. 63:1162-1171. Summary: This study found that bullfrogs were less likely than pond permanence and non-native fish to explain native anuran distributions in western Washington, USA. Adams, M. J. 2000. Pond permanence and the effects of exotic vertebrates on anurans. Ecological Applications 10:559-568. Ballard, Adam S.; Balfour, Peter S.; Conway, Courtney J. 2008. Rana catesbeiana (American Bullfrog) Predation, Herpetological Review 39(4): 462-463. Batista, Cristiane G. 2002. Rana catesbeiana (bullfrog) Effects on Native Anuran Community, Herpetological Review 33(2): 131. Blaustein, A.R. and Kiesecker, J.M. 2002. Complexity in conservation: lessons from the global decline of amphibian populations. Ecology Letters. 5 (4): 597. Summary: This review paper discusses the complex range of factors contributing to the decline in amphibian populations, including the bullfrogs effects on red-legged frogs (Rana aurora) in the USA . Bolek, Matthew G; Janovy, John Jr. 2007. Rana catesbeiana (American bullfrog) Diet, Herpetological Review 38(3): 325-326. Boone, Michelle D; Little, Edward E. ; Semlitsch, Raymond D. 2004. Overwintered Bullfrog Tadpoles Negatively Affect Salamanders and Anurans in Native Amphibian Communities, Copeia 3: 683-690. Summary: This study demonstrates that overwintered Bullfrog tadpoles can respond to changing pond hydroperiods and can negatively impact metamorphosis of native amphibians. Bradford, D.F. ; Jaeger, J.R. and Jennings, R.D. 2004. Population status and distribution of a decimated amphibian, the relict leopard frog (Rana onca. Southwestern Naturalist. 49 (2): 218-228. Summary: Discusses the factors causing the decline of the leopard frog, including competition with introduced bullfrogs. Bury, R. B. and Whelan, J. A. 1984. Ecology and management of the bullfrog. U.S. Dept. of the Interior, Fish and Wildlife Service, Resource Publication 155, Washington, D.C.
Summary: A comprehensive summary and critical review of information on the biology of the bullfrog related to its ecology, status, culture and management. Literature through 1982 is included. Bury, R.B. and Whelan, J.A. 1984. Ecology and management of the bullfrog. U.S. Dept. of the Interior, Fish and Wildlife Service, Resource Publication 155, Washington, D.C.
Summary: A comprehensive summary and critical review of information on the biology of the bullfrog related to its ecology, status, culture and management. Literature through 1982 was included. CABI Bioscience. 2005. An inventory of alien species and their threat to biodiversity and economy in Switzerland STORED IN �COUNTRY� FILE FOR FULL REPORT. CABI Bioscience Switzerland Centre report to The Swiss Agency for Environment, Forests and Landscape SAEFL Del�mont. Carpenter, Niel M; Casazza, Michael L; Wylie, Glenn D. 2002. Rana catesbeiana (bullfrog) Diet, Herpetological Review 33(2): 130. Casas-Andreu, Gustavo; Cruz-Avina, Ricardo; Aguilar Miguel, Xochitl. 2002. Rana catesbeiana (bullfrog), Herpetological Review 33(1): 63. Casas-Andreu, Gustavo; Cruzavina, Ricardo; Aguilar Miguel, Xochitl. 2002. Rana catesbeiana (bullfrog), Herpetological Review 33(2): 146. Casper, Gary S. & Russ Hendricks. 2005. Rana catesbeiana Shaw, 1802: American Bullfrog. Modified from Amphibian Declines: The Conservation Status of United States Species, edited by Michael Lannoo (2005 by the Regents of the University of California), used with permission of University of California Press. The book is available from UC Press. Chivers, D.P., Wildy, E.L., Kiesecker, J.M. and Blaustein, A.R. 2001. Avoidance response of juvenile Pacific treefrogs to chemical cues of introduced predatory bullfrogs. Journal of Chemical Ecology. 27 (8): 1667-1676. Summary: This paper discusses the predator-prey interactions between bullfrogs and Pacific treefrogs (Hyla regilla. Christiansen, J.I. 2001. Non-native amphibians and reptiles in Iowa. Journal of the Iowa Academy of Science. 108 (4): 210-211. Summary: This paper details the introduction of non-native amphibians to Iowa, including the bullfrog. Clarkson, Robert W. & James C. deVos, Jr. 1986. The Bullfrog, Rana catesbeiana Shaw, in the Lower Colorado River, Arizona-California, Journal of Herpetology 20(1): pp. 42-49. Summary: This report documents ecological studies of the American bullfrog in the lower Colorado River, Arizona-California, during the summer of 1981, including density, habitat use, food preference and breeding behaviour. Combs, Ashley ; Hess, Garrett ; Chapman, Corey ; Stovall, Austin ; Burns, Zach ; Matthews, Stephen ; Goins, John David. 2005. Rana catesbeiana (American bullfrog) Diet, Herpetological Review 36(4): 43. CONABIO. 2008. Sistema de informaci�n sobre especies invasoras en M�xico. Especies invasoras - Anfibios. Comisi�n Nacional para el Conocimiento y Uso de la Biodiversidad. Fecha de acceso. Cook, David. 2002. Rana aurora draytonii (California Red-legged Frog) Predation, Herpetological Review 33(4): 303. Cook, David G.; Jennings, Mark R. 2007. Microhabitat use of the California Red-legged Frog and Introduced Bullfrog in a Seasonal Marsh, Herpetologica 63(4): 430-440. Summary: Cook and Jennings (2007) conducted a study on the native red-legged frog and introduced bullfrog in a fish-free, structurally complex marsh not altered in ways that give obvious advantages to the bullfrog. Specifically, they determined: (1) the seasonal abundance of both species; and (2) the habitat use patterns. Cross, Chad L; Gerstenberger, Shawn L. 2002. Rana catesbeiana (American bullfrog) Diet, Herpetological Review 33(2): 129-130. Da Silva, Emanuel T; Costa, Henrique C. ; Feio, Renato N. 2007. Rana catesbeiana (American Bullfrog) Prey, Herpetological Review 38(4): 443. De Pascual, Amelia Diaz; Guerrero, Cherly. 2008. Diet Composition of Bullfrogs, Rana catesbeiana (Anura: Ranidae) Introduced into the Venezuelan Andes, Herpetological Review 39(4): 425-427. Drost, Charles A. & Gary M. Fellers. 1996. Collapse of a Regional Frog Fauna in the Yosemite Area of the California Sierra Nevada, USA, Conservation Biology 10(2): 414-425. Summary: Dramatic losses of native amphibians in the Sierra Nevada mountains are documented and compared with baseline zoological surveys from the early 1900s. Potential causes are named as predatory fish and loss of refuge habitats. Eason, G.W. and Fauth, J.E. 2001. Ecological correlates of anuran species richness in temporary pools: A field study in South Carolina, USA. Israel Journal of Zoology. 47 (4): 347-365. Summary: This paper outlines anuran diversity in temporary ponds in South Carolina, USA. Encyclopedia of Life. 2009. Rana catesbeiana Shaw, 1802. Enge, K.M. and Wood, K.N. 2001. Herpetofauna of Chinsegut Nature Center, Hernando County, Florida. Florida Scientist. 64 (4): 283-305. Summary: This paper reports on the reptile and amphibian species present at Chinsegut Nature Center, Florida, USA, including the bullfrog. Ferreira, Rachel; Fonseca, Leila de Souza ; Afonso, Andre Muniz ; da Silva, Marlei Gornes ; Saad, Maria Helena ; Lilenbaum, Walter. 2006. A Report of Mycobacteriosis Caused by Mycobacterium marinum in Bullfrogs (Rana catesbeiana), Veterinary Journal 171(1): 177-180. Summary: The occurrence of mycobacteriosis caused by Mycobacterium marinum in a commercial breeding farm of bullfrogs (Rana catesbeiana) in Rio de Janeiro, Brazil is described. It is suggested that M. marinum is an important agent of granulomatous disease in bullfrogs and that infected animals, even when asymptomatic, could act as reservoirs spreading the disease and contaminating other frogs in the farm. Ficetola, Gentile Francesco, Christophe Co�c, Mathieu Detaint, Matthieu Berroneau, Olivier Lorvelec & Claude Miaud. 2007a. Pattern of Distribution of the American Bullfrog Rana catesbeiana in Europe, Journal Biological Invasions 9(7): 767-772. Summary: This report documents the trends of populations of the American bullfrog in Europe from surveys of wetlands in southwest France and questionnaires investigating the situation at a continental scale. Flores, N.A. 2005. Cultured Aquatic Species Information Programme: Rana catesbeiana (Shaw, 1862 ). Fisheries and Aquaculture Department (FAO). Foster, B.J. ; Sparks, D.W. and Duchamp, J.E. 2004. Urban herpetology II: Amphibians and reptiles of the Indianapolis airport conservation lands. Proceedings of the Indiana Academy of Science. 113 (1): 53-59. Summary: Survey of amphibians and reptiles in Hendricks and Marion counties, Indiana, USA. Garner, Trenton W.J; Matthew W Perkins; Purnima Govindarajulu; Daniele Seglie; Susan Walker; Andrew A Cunningham and Matthew C Fisher. 2006. The emerging amphibian pathogen Batrachochytrium dendrobatidis globally infects introduced populations of the North American bullfrog, Rana catesbeiana, Biol. Lett. 2 (3): 455-459. Summary: Batrachochytrium dendrobatidis is the chytridiomycete fungus which has been implicated in global amphibian declines and numerous species extinctions. Garner and colleagues (2006) show that introduced North American bullfrogs (Rana catesbeiana) consistently carry this emerging pathogenic fungus. Govindarajulu, Purnima; W. M Stephen Price, Bradley R. Anholt. 2006. 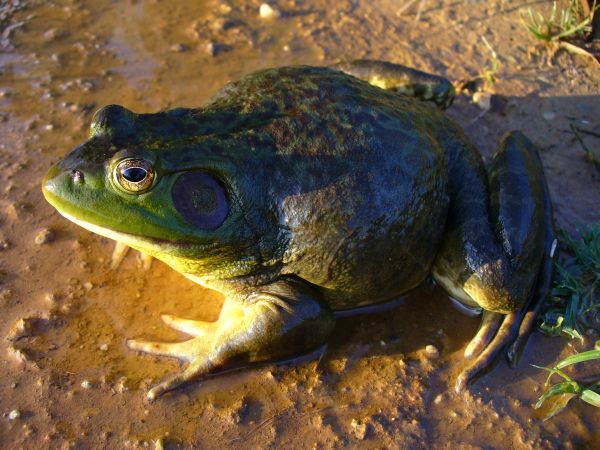 Introduced Bullfrogs (Rana catesbeiana) in Western Canada: Has Their Ecology Diverged? Journal of Herpetology 40(2): 249-260. Hasegawa, Hideo. 2006. First record of Falcaustra catesbeianae Walton, 1929 (Nematoda, Cosmocercoidea, Kathlaniidae) from the bullfrog, Rana catesbeiana, in Japan, Biogeography: 1-5. Hayes, Marc P. & Mark R. Jennings. 1986. Decline of Ranid Frog Species in Western North America: Are Bullfrogs (Rana catesbeiana) Responsible? Journal of Herpetology 20(4): 490-509. Summary: The authors present four alternative hypotheses relating to the decline of ranid frog species native to western North America: 1) bullfrog introduction, 2) habitat alteration; 3) predation by introduced fish; and 4) commercial exploitation. The authors review data relating to four other factors suggested as having caused declines: 1) toxicants, 2) pathogens and parasites, 3) acid rain, and 4) catastrophic mortality. In the absence of satisfactory data, the chronological priority of fish introductions over those of bullfrogs and the greater access fish may have to earlier ranid life stages make the fish predation hypothesis more compelling. Helfrich, L.A., Neves, R.J., Parkhurst, J. 2009. Commerical Frog Farming. Virginia Cooperative Extension. Publication 420-455. Hirai, T. 2004. Diet composition of introduced bullfrog, Rana catesbeiana, in the Mizorogaike Pond of Kyoto, Japan. Ecological Research. 19 (4): 375-380. Summary: This paper gives details about the diet of introduced bullfrogs in Mizorogaike Pond, in Kyoto, Japan. Hirai, Toshiaki. 2004. Diet composition of introduced bullfrog, Rana catesbeiana, in the Mizorogaike Pond of Kyoto, Japan, Ecological Research 19: 375�380. Summary: To study the bullfrog�s diet to assess its effect on a native fauna, Hirai (2004) presents in this paper the diet composition of the bullfrog in the Mizorogaike Pond, Kyoto, Japan. The author analysed the stomach contents of bullfrogs and found that adult bullfrogs feed predominantly on crayfish, and juveniles feed on a diverse range of arthropods. Hirai, Toshiaki. 2006a. Predation by Rana catesbeiana on a Breeding Male of Rana japonica, Bulletin of the Herpetological Society of Japan(1): 15-16. Hirai, Toshiaki. 2006b. Predation by Rana catesbeiana on a Juvenile of Cynops pyrrhogaster, Bulletin of the Herpetological Society of Japan(1): 16-17. Summary: Hirai (2006b) reports on prey items foung in a bullfrog captured beside a paddy field. Hou, Ping-Chun Lucy, Shiau, Tsu-Way, Tu, Ming-Chung, Chen, Ching-Chi, Chen, Tung-Yu, Tsai, Ya-Fen, Lin, Chun-Fu & Wu, Sheng-Hai. 2006. Exotic Amphibians in the Pet Shops of Taiwan, Taiwania 51(2): 87-92. Jung, R.E., Bonine, K.E., Rosenshield, M.L., de la Reza, A., Raimondo, S. and Droege, S. 2002. Evaluation of canoe surveys for anurans along the Rio Grande in Big Bend National Park, Texas. Journal of Herpetology. 36 (3): 390-397. Summary: This paper outlines the distribution of bullfrogs in Big Bend National Park, Texas, USA. Kats, L.B. and Ferrer, R.P. 2003. Alien predators and amphibian declines: review of two decades of science and the transition to conservation. Diversity and Distributions. 9 (2): 99. Summary: This article discusses the impacts of alien species in North America, including the bullfrog. Kiesecker, J.M. ; Blaustein, A.R. and Miller, C.L. 2001. Potential mechanisms underlying the displacement of native red-legged frogs by introduced bullfrogs. Ecology. 82 (7): 1964-1970. Summary: This paper gives detailed information about the competition between bullfrogs and native red-legged frogs (Rana aurora) in Oregon, USA. Kupferberg, S. J. 1997. Bullfrog (Rana catesbeiana) invasion of a California river: the role of larval competition. Ecology 78(6): 1736-1751. Summary: Native yellow-legged frogs, Rana boylii, were almost an order of magnitude less abundant in reaches where bullfrogs were well established. Competition from large overwintering bullfrog larvae significantly decreased survivorship and growth of native tadpoles. Laufer, G., Canavero, A., Nunez, D. & Maneyro, R. 2008. Bullfrog (Lithobates catesbeianus) invasion in Uruguay. Biological Invasions 10: 1183-1189. Lawler, S.P., Dritz, D., Strange, T. and Holyoak, M. 1999. Effects of introduced mosquitofish and bullfrogs on the threatened California red-legged frog. Conservation Biology. 13 (3): 613-622. Summary: This paper compares the effects of bullfrogs and mosquitofish (Gambusia affinis) on the declining California red-legged frog (Rana aurora draytonii). Lawler, S.P., Holyoak, M., Dritz, D. & Strange, T. 1999. Effects of introduced mosquitofish and bullfrogs on the threatened California red-legged frog. Conservation Biology 13(3): 613-622. LeClere. n.d. Bullfrog Rana catesbeiana. Amphibians and Reptiles of Minnesota. Lopez-Flores, M.; Cruz-Burgos, J.A. and Vilella, F.J. 2003. Predation of a white-cheeked pintail (Anas bahamensis) duckling by a bullfrog (Rana catesbeiana). Caribbean Journal of Science. 39 (2): 240-242. Summary: This short note gives details about an incident of a bullfrog preying on the duckling of a white-cheeked pintail (Anas bahamensis) in Puerto Rico. Lorvelec, Olivier & Mathieu D�taint. 2006. Lithobates catesbeianus. Delivering Alien Invasive Species Inventories for Europe. Summary: Species account in Europe. Merovich, C.E. and Howard, J.H. 2000. Amphibian use of constructed ponds on Maryland s eastern shore. Journal of the Iowa Academy of Science. 107 (3-4): 151-159. Summary: This paper gives the results of a study of amphibian assemblages in constructed ponds in Maryland, including the presence of bullfrogs. Summary: Introduction of the bullfrog Rana catesbeiana is considered detrimental to native fauna. However, methods for controlling bullfrog populations have not yet been established. Managing habitats to resist invasion is important for alien species that are difficult to control directly. We surveyed habitat characteristics of paddy fields in eastern Japan inhabited by bullfrogs and analyzed their microhabitat selection. Our results suggest that adult bullfrogs prefer microhabitat with deep water. Therefore, it may be possible to prevent invasion of adults by keeping water shallow. Managing local habitats to prevent immigration may reduce the spread of bullfrogs on larger spatial scales. National Research Council. 1974. Amphibians. Guidelines for the breeding, care and management of laboratory animals. Washington, D.C.: National Academy of Sciences. Summary: Nine families of the class Amphibia are represented in British Columbia. Eighteen species are native, and at least two nonnatives have become established. Among the native species are a number of habitat specialists whose declines are clearly attributable to habitat destruction through human disturbance. It is suggested that predation and competition from increasing populations of introduced fish and bullfrogs (Rana catesbeiana ), as well as from managed populations of native waterfowl, may have contributed to the decline of these species. Pearl, C.A. ; Adams, M.J.; Bury, R.B. ; and McCreary, B. 2004. Asymmetrical effects of introduced Bullfrogs (Rana catesbeiana) on native ranid frogs in Oregon. Copeia. 2004 (1): 11-20. Summary: This paper discusses the impacts introduced bullfrogs have has on native frogs in Oregon. Pearl, C.A. ; Adams, M.J.; Schuytema, G.S. and Nebeker, A.V. 2003. Behavioral responses of anuran larvae to chemical cues of native and introduced predators in the Pacific Northwestern United States. Journal of Herpetology. 37 (3): 572-576. Summary: This paper discusses the responses of native and introduced anurans to predator cues. Pryor, G.S. 2003. Growth rates and digestive abilities of bullfrog tadpoles (Rana catesbeiana) fed algal diets. Journal of Herpetology. 37 (3): 560-566. Summary: Contains information about the digestive abilities of tadpole bullfrogs. Roach, J. 2004. Invading Bullfrogs appear nearly unstoppable. National Geographic News, September 28, 2004. Santos-Barrera, G., Hammerson, G., Hedges, B., Joglar, R., Inchaustegui, S., Lue Kuangyang, Chou Wenhao, Gu Huiqing, Shi Haitao, Diesmos, A., Iskandar, D., van Dijk, P.P., Masafumi Matsui, Schmidt, B., Miaud, C. & Mart�nez-Solano, I. 2009. Lithobates catesbeianus. In: IUCN 2009. IUCN Red List of Threatened Species. Version 2009.2. .
Smith, G.R. 1999. Microhabitat preferences of bullfrog tadpoles (Rana catesbeiana) of different ages. Transactions of the Nebraska Academy of Sciences. 25 (0): 73-76. Summary: This paper gives the results of an investigation into the habitat preferences of bullfrog tadpoles. Smith, H.M. and Chiszar, D. 2003. Distributional and variational data on the frogs of the genus Rana in Chihuahua, Mexico, including a new species. Bulletin of the Maryland Herpetological Society. 39 (3): 59-66. Summary: This paper gives details about the Rana spp. occurring in Chihuahua, Mexico. Stumpel, A. H. P., 1992. Successful reproduction of introduced bullfrogs Rana catesbeiana in northwestern Europe: A potential threat to indigenous amphibians. Biological Conservation. Vol. 60, no. 1, pp. 61-62. 1992. Summary: In The Netherlands, Belgium, and Germany, bullfrog (Rana catesbeiana) larvae are imported on a large scale for trade in pet shops. Many of them survive the goldfish bowl and are then released in the wind as larvae or freshly metamorphosed juveniles. Since many records exist of full-grown bullfrogs, the animals clearly can reach adulthood in the wild. Nature conservationists have great concern about the potential threat to indigenous amphibians, and particularly to green frogs Rana esculenta complex, which occupy more or less the same niche. Examples of bullfrogs expelling other species have been shown by Dumas (1966), Moyle (1973) and Hammerson (1982). In The Netherlands there is no legislation that prevents this trade. Until recently, reproduction of bullfrogs has not been recorded in The Netherlands. In 1991, it became clear that reproduction had taken place since 1989 in a large garden pond in the city of Breda (central-south Netherlands). Summary: An overview of the biology and problems caused by bryozoans. Wylie, G.D.; Casazza, M.L. and Carpenter, M. 2003. Diet of bullfrogs in relation to predation on giant garter snakes at Colusa National Wildlife Refuge. California Fish and Game. 89 (3): 139-145. Summary: This paper outlines the relationship between bullfrog predation on giant garter snakes (Thamnophis gigas), and vice versa, in Colusa National Wildlife Refuge, California, USA. Wylie, Glenn D. ; Casazza, Michael L. ; Carpenter, Mike., 2003. Diet of bullfrogs in relation to predation on giant garter snakes at Colusa National Wildlife Refuge. California Fish & Game. 89(3). Summer 2003. 139-145. Summary: To evaluate predation by bullfrogs, Rana catesbeiana, on giant garter snakes, Thamnophis gigas, at Colusa National Wildlife Refuge (NWR) we collected 99 bullfrogs during three field seasons from 2000-2002. Crayfish, Procambarus clarkii, were in 90% of the bullfrogs and were usually the only food item. We found four neonate giant garter snakes in three bullfrogs. We estimated the total annual predation of bullfrogs to be about 22% of neonate production, a value similar to the 20% tail loss we documented for giant garter snakes on the Refuge as another index of bullfrog predation pressure. Even with mortality from bullfrogs and other predators, snake size classes indicate sustainable recruitment into the Colusa NWR giant garter snake population. Smaller bullfrogs and bullfrog tadpoles are also food for giant garter snakes, so further studies are needed to determine the net effect of bullfrog removal for local giant garter snake populations. Zampela, R.A. and Bunnell, J.F. 2000. The distribution of anurans in two river systems of a coastal plain watershed. Journal of Herpetology. 34 (2): 210-221. Summary: This paper gives details about the distribution of anurans in the New Jersey Pinelands. Purnima Govindrajulu has completed her doctoral research on the impact of bullfrogs on native frogs in December 2004. She is currently working on a post-doctoral project surveying for chytrid fungus is native and introduced amphibians in British Columbia. She will also be teaching a course on the ecological, social and economic impact of biological invasions at the University of Victoria during summer. Her previous work includes near-shore marine surveys and impact assessment studies in the Caribbean and behavioural ecology of primates.